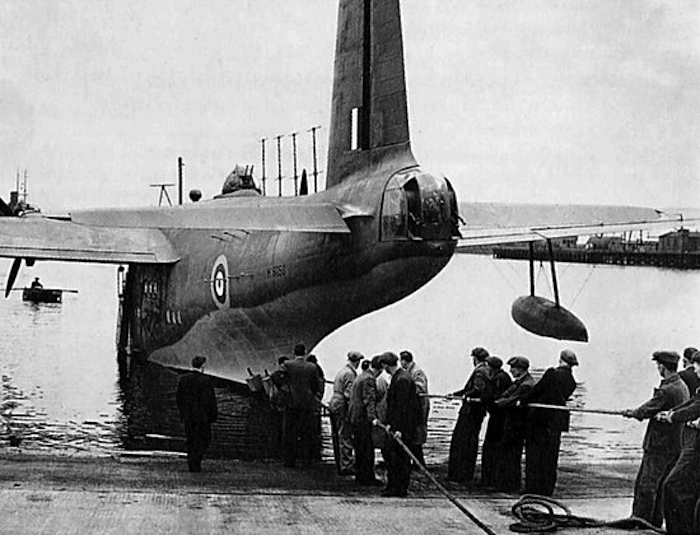 The purpose of this picture is to show and explain the presence of the four antennas at the tail of the above Sunderland, and also to explain their absence in later photographs; they were nick-named 'Christmas Trees' by the crew. You will see another set of antennas on the body of the aircraft, visible just above the roundel. What is actually going on is that the craft is being hauled up to be 'wheeled' preparatory to work on the hull, yimken. A 'Christmas Tree' indicates that the aircraft is a Mark II, fitted with a Mark II ASV (Airborne Surface Vessel) radar operating at 1.5m wavelength (200Mhz). When they are absent it means that a more advanced ASV System is installed. Sometimes it may be that the Censor removed them from a photo. 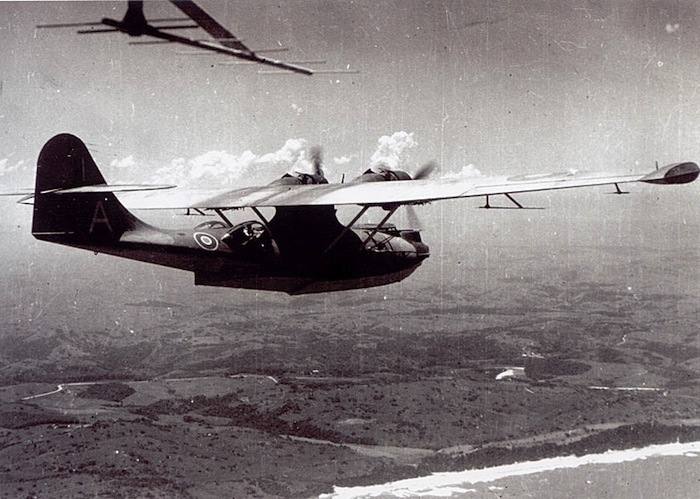 This Catalina shows two types of aerials, as we called them at the time, now known as antennas. The radar transmiter and receiver antennas are visible under the wing of the aircraft. They are half-wave dipoles dimensioned for a 50cm wavelength (600Mhz). A simple dipole has a broad response as shown in the polar diagram below where forward and backward lobes can be seen. It therefore has the ability to detect a vesell in front of, or behind the aircraft. Not so good at the sides. The other antenna, visible at the top left of the picture, is a multi-element dipole assembly which has a much narrower polar diagram, so can locate a target more precisely, but only in front of the aircraft. So, turn the aircraft until the antenna is central; the target is then in front. However, that antenna is almost certainly on the nose of the Catalina from which the photo ws taken. There would be the same thing on the central Catalina. Photograph Left - A lot of people say they invented Radar - well - they didn't - because this man, Dr Sir Robert Watson-Watt did, in 1935. He was Superintendent of the DSIR Radio Research Station at Slough. If we are going to debate it then I say James Clerk Maxwell did it in 1862, when he said that a radio signal would bounce off a metal surface. DSIR, by the way, stands for the Department of Scientific and Industrial Research until a name-change in 1964 when it became the Ministry of Technology; I worked in both. Photograph Right - A radar op at his post. Earlier radar equipment had a cowl over the screen into which an operator had to peer - hence the need for refief. The type of radar equipment fitted in aircraft, late in the war, or post-war. Secrecy, and security, at the time, suppressed photographs, in fact, severly prohibited them. The picture shows the valve-based type of construction of elecronic equipment at the time. It shows both octal-base valves (8 pins) and, more significantly the EF50-type of valve in its B9G base, with clamping ring. The EF50, mainstay of late war radar, and a vital component of the early computers, such as Cambridge University's EDSAC, was an RF pentode. A pentode, as the name implies, was a five-element component. See the picture below for an explanation, or for applications and circuits diagrams at the excellent St Andrews University web-page here. Photograph Left - The ubiquitious EF50, the 'E' standing for Eindhoven, the Philips factory from where it originated in 1938 and intended for HF and VHF radio and then television. Photograph Right - A circuit diagram of a pentode with the names of the five elements. A full explanation of the function of these grids is given in the St Andrews University web-page here.